This April, Belfast-based early music ensemble Sestina will perform Handel’s oratorio Theodora, supported by funding from their sponsors Exitex Ltd., the Arts Council of Northern Ireland National Lottery Funding, and partnership funding from the Irish Baroque Orchestra. 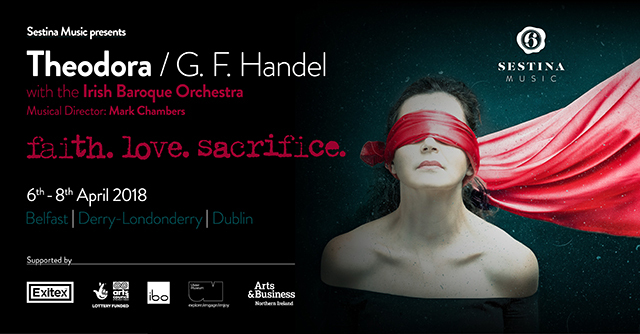 The ensemble, which has built a strong reputation in recent years for its innovative interpretations of the works of Purcell and Handel among others, will perform the neglected masterpiece in Belfast, Derry-Londonderry and Dublin. The oratorio, which tells the tale of forbidden love between Christian Queen Theodora and Roman convert Didimus, will feature a stellar cast of talented young voices, with the spotlight firmly on home grown talent. Local singers Joseph Zubier, Aaron O’Hare, Peter Harris and Laura Lamph will feature as soloists, accompanied by a chorus of 24 young singers from both north and south of the border. Tickets for the concert are available from www.sestinamusic.com and from the Visit Belfast Welcome Centre.